The 130,000-ton Carnival Breeze, Carnival Cruise Lines’ newest ship, is shown here conducting sea trials in the Adriatic Sea in preparation for its inaugural June 3 voyage from Venice, Italy. The 3,690-passenger vessel, currently in the final stages of construction at the Fincantieri shipyard in Monfalcone, Italy, had a full contingent of officers, technicians, and engineers on board who thoroughly tested the Carnival Breeze’s sophisticated navigation, technical and mechanical systems. Carnival Breeze will offer a variety of innovations, including the line’s first Thrill Theater, an immersive multi-dimensional special effects experience that makes viewers feel as if they’re part of the movie, along with popular features such as WaterWorks, with fun water slides and attractions, and SportSquare, an expansive top-deck recreation area with a ropes course, mini-golf, an outdoor fitness area and more. Exclusive to Carnival Breeze is Bonsai Sushi, the line’s first full-service sushi restaurant, and Fat Jimmy’s C-Side BBQ, an open-air dining venue featuring a variety of grilled barbecue favorites and traditional sides. 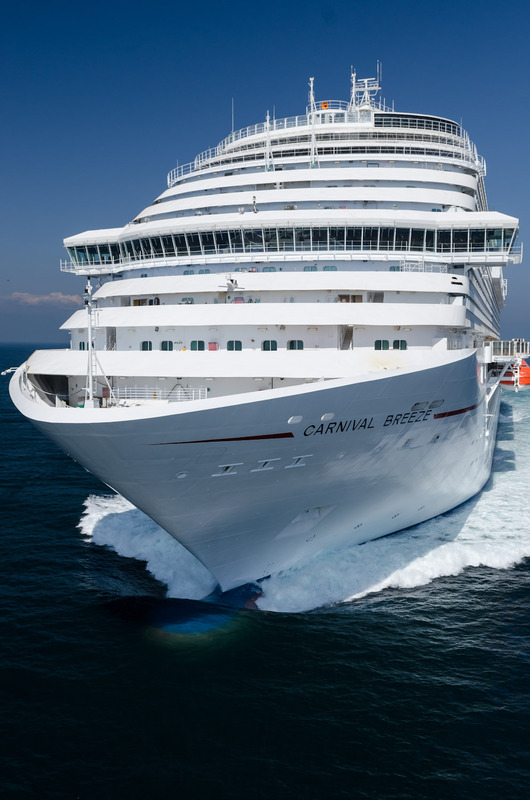 Following its inaugural 12-day cruise that departs Venice June 3 and arrives in Barcelona June 15, Carnival Breeze will operate a summer schedule of Mediterranean voyages from Barcelona through October 25. The ship will then sail on a 15-day transatlantic crossing from Barcelona to Miami, positioning the vessel for year-round six- and eight-day Caribbean departures beginning November 24, 2012. Carnival Breeze will be Carnival Cruise Lines’ largest ship ever based in South Florida.